This conference was presenting the main outputs and activities from the JISC funded PC3 project over the last 3 1/2 years. This was an interactive event giving participants the opportunity to experience various aspects of coaching for themselves. Presentation slides and videos of the sessions are available below. 1:55 Dawn Wood – An Elephant, A Monkey and A Sheep. The Handout for the coaching activity. 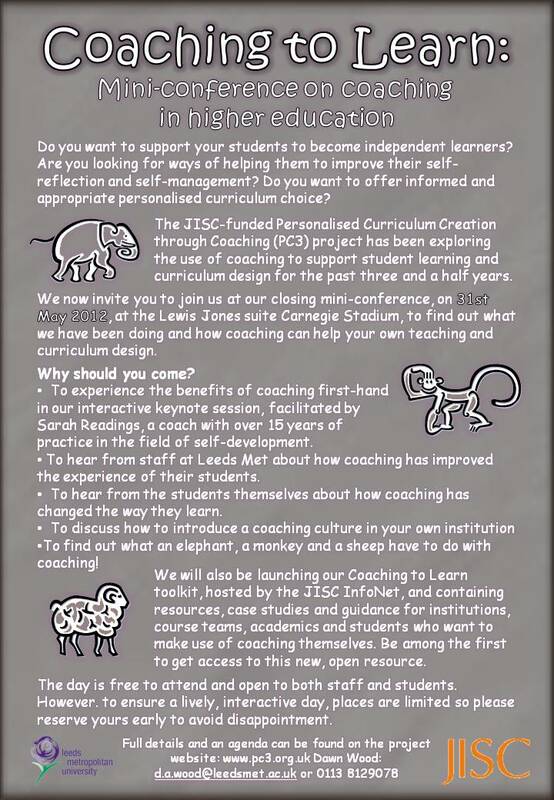 3.15 Janet Finlay – Coaching Tool-Kit: a free resource to enable students, staff, course teams and institution to embed coaching practice in the learning and teaching. This was a free event on May 31st at the Lewis Jones Suite in Carnegie Stadium, Headingley Leeds. thank you for all the great blog posts.